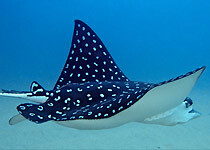 Please send me more information on Manta Scuba Diving! Manta Scuba Diving is located in Cabo San Lucas, where the Sea of Cortez and Pacific Ocean converge to create one of the world's most dynamic marine environments. Described by Jacques Cousteau as "one the richest seas of the world," this is among the top places to dive worldwide—you’ll be awed by the amount and variety of marine life here. Combined with the spectacular underwater landscapes of cliffs and canyons, this location provides unforgettable dive experiences. Manta Divers uses PADI-certified divemasters and instructors to ensure that your diving is fun and safe. 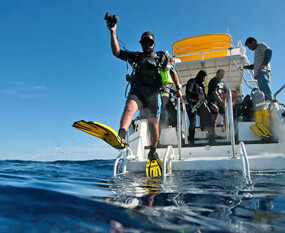 Some of the packages and diving expeditions require a minimum number of divers. For smaller groups, please contact us and we will try to coordinate a larger group for the dive. 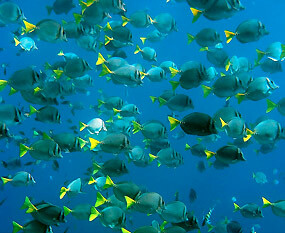 The Sea of Cortez is home to hundreds of species of fish, rays, sea lions and pelagics. Many local dive sites are located just a 10-minute boat ride from the Marina. 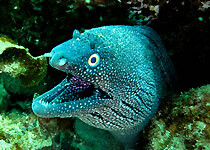 Most of the dive sites are great for beginners as well as experienced divers. Dive locations near Cabo include: Pelican Rock, The Sand Falls, Neptune''s Finger, The Point or "Land''s End," and North Wall. Dive locations in the Corridor include Whales Head, Santa Maria, Blow Hole, Chileno, Twin Dolphin and Gavilan. Departure times: 8:00am or 1:00pm. Night dives depart at 6pm or 8pm depending on the time of year (please arrive 30 minutes prior). Price is per person and includes tax, guide, snorkel gear and purified water. The expeditions are all one-day trips, and usually run in the summer months from June to November when the water is warming up and the visibility is at its best. This time of year, the light breezes off the Sea of Cortez provide a perfect climate to enjoy the region’s amazing marine life. Visit beautiful coves and lovely beaches between dive sites. Certified divers only. Cabo Pulmo is one of North America’s only living coral reef systems and is an outstanding location on the Sea of Cortez for snorkeling or diving. Cabo Pulmo is located in the East Cape area of Baja California Sur. Prices are per person and include 2 dives, tax, round-trip transportation from resort/villa, soft drinks, light breakfast and lunch. Check-in at 6:45am. Tour departs at 7:00am and returns at 4:30pm. May - November (subject to change). Four person minimum. Certified advanced divers and AOW/Nitrox divers only. Gordo Banks is located approximately 5 miles offshore from San José del Cabo and is the site of a seamount with excellent diving. 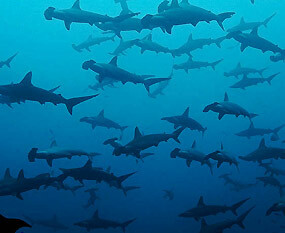 Some species include hammerhead sharks, rays, tuna, marlin, snappers and more. Expedition prices are per person and include 2 dives, tax, soft drinks, and snacks. Tour departs at 7:45am and returns at 2:00pm. Please arrive to the Manta Dive facilities 30 minutes prior to departure. May - June (subject to change). Three person minimum. Enjoy a 2 hour drive to La Paz to snorkel with docile Whale Sharks, then travel to the Sea Lion Colong to watch the Brown California Sea Lions play and explore. Includes transportation, food, drinks, guide, snorkel gear, 1 tank, and weights. Tour departs at 6:15am and is 12 hours long. October - January (subject to change). Four person minimum. Manta Divers offers a wide range of scuba courses, from the most basic certification course up to the divemaster level. Each individual gets personalized attention and support. Manta is committed to safety, professionalism and fun! All courses include books, and certification card. The resort course is a great opportunity for people who are not certified and have never been diving. A basic training and a shallow dive under the supervision of a licensed diving instructor can be the highlight of your vacation. Duration: approximately 3 hours. Gear rental is $35 and paid for directly with the vendor. For certified divers who haven't been diving in a few years or feel rusty. Basic instruction and a few practice skill in shallow water will be followed by two dives with a licensed instructor. Duration: Approximately 3-4 hours. Gear rental is $35 and paid for directly with the vendor. course, designed to teach theory and skills that a certified diver should master. Four open dives are included in the course as well as pool work and academic study. By completing the course, you will get a PADI Scuba diving certification that is valid all over the world. Duration: 4 days, approximately 7-8 hours per day. This course is designed for those who have completed their academic and pool sections elsewhere, and have been referred to Manta Scuba to complete their PADI open-water diver certification in Cabo. It is necessary to have the PADI Referral form signed by a PADI Scuba instructor. The form is valid for 6 months. Duration: 2 days. The PADI advanced course is great for the open-water diver who wants to learn a few more skills as well as gain experience while diving with the Scuba instructor. Duration: 5 dives over 2 days.